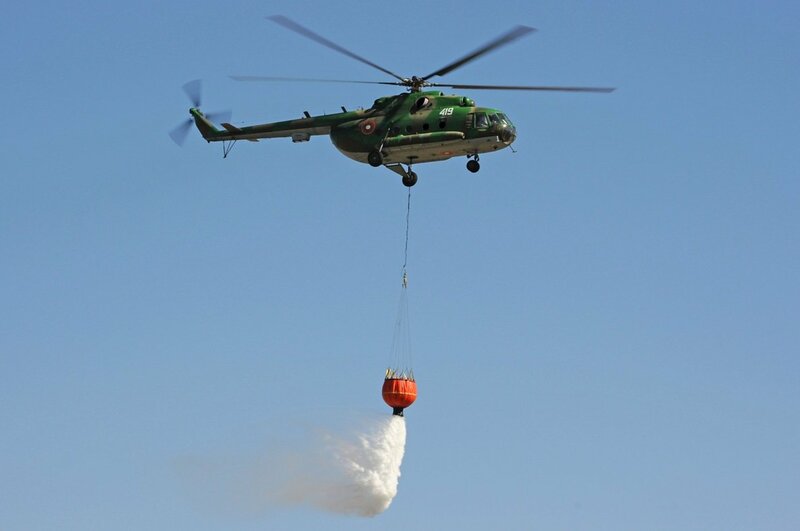 SOFIA, Bulgaria (BulgarianMilitary.com) – So far, Bulgaria still remains without helicopters for aerial firefighting since the procurement for the delivery of this type of equipment, namely Bambi Bucket for two Cougar helicopters, has failed. This is reported by the Bulgarian aviation magazine Аеropress, referring to a decision signed on 31th October by the Commander of the Bulgarian Air Force Major General Tsanko Stoykov, which is published on the website of the service, learned BulgarianMilitary.com. Bulgaria’s Air Force has such equipment, but it is compatible with the Mi-17 helicopters and after the last Mi-17 crashed earlier this year, leaving two people dead, the Bulgarian government decided to allocate BGN 300 000 to equip two Cougar aircraft with firefighting systems. Within this budget the Air Force launched a public procurement for the delivery of two Bambi Bucket systems, with maximum value of BGN 110 000 (with VAT). It also included the training of the pilots who would operate the helicopters. It appears that the selected company Bul Trade Ltd., based in Burgas, has refused to enter into a contract, the reasons for which are not publicly known, and the Air Force Commander decided to stop the procedure as the second qualified bid significantly exceeds the financial resources allocated to it. Three companies have submitted documents for executing the delivery and as a contractor was chosen the company registered in Burgas with the lowest bid price of BGN 103 000 (with VAT). The second-placed bidder Petromar PLC has offered BGN 193 267.20 (with VAT) to deliver the two Bambi Bucket systems for the Cougars and the third contestant CAST Engineering Ltd. has been disqualified because of incomplete documents. At the moment, it is not clear whether a new project will be launched and what its budget will be. MoD intended to acquire the aerial firefighting equipment as well as to complete the pilots’ training before the fire danger season in 2019, in time for the possible forest fires in the summer of next year. However, the Bulgarian Air Force has failed to implement the procedure and if the problem is not resolved, our country will be forced to rely on hired foreign or private aerial firefighting equipment. The systematic problem of the Bulgarian Ministry of Defence with the public procurements implementation as well as their failure was commented by the Defence Minister Krasimir Karakachanov, who said that the repair and maintenance of military equipment should fall outside the scope of the Public Procurement Act so that they cannot be sabotaged so often and to proceed faster. For this purpose, Bulgarian MoD has proposed legislative changes that are not yet public but these changes have already raised doubts as to whether this will lead to manipulation and contractors known in advance.